brim measures 19", 21", or 23"
Knit in the round from the top down. 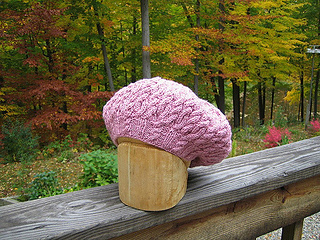 NOTE: E-mail the designer at yarnworks@figheadh.com and she will be happy to send you the original chart for this tam. A few of the purl sts seemed to have fallen out in the translation. This is not the pattern, mind you. For that you must purchase the magazine issue. Thanks! 27 sts and 35 rnds = 4”/10cm over chart 1 using size 6 (4mm) needles. 24 sts and 36 rnds = 4”/10cm over chart 2 using size 5 (3.75mm) needles. TAKE TIME TO CHECK GAUGES.